The primitive brute force approach is to fill up all of the blank spaces randomly with numbers from 1 to 9 until a valid solution (i.e. no two numbers in any row, column or big box) is found. On the other hand, the backtracking algorithm fills up a blank cell with a valid number (i.e. no two same numbers in any row, column or big box), moves on to the next cell, and then does the same thing. If all the possible numbers from 1 to 9 are invalid for any cell that the algorithm is currently “at”, the algorithm moves back to the previous cell and changes that cell’s value to another valid number. Afterwards, it moves back to the next cell and the whole process repeats. return true; // Empty cells filled. Solution found. Abort. return false; //Solution not found. Backtrack. Below is an visualization of the algorithm in action. It shows the decisions of the algorithm for the first few steps. 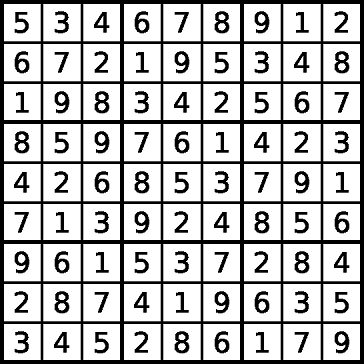 We take the above puzzle as an example: The backtracking algorithm starts with the cell to the right of 3 in the top left corner of the grid. It fills in the number 1, which is the first possible valid number for that cell. The algorithm now moves to the cell on the right. Here, it skips the number 1 (because there is already a 1 in the same big cell), and fills in the number 2. Now to the next cell to the right, it fills in the number 4. And then the next cell, 8. And then the next cell, 9. 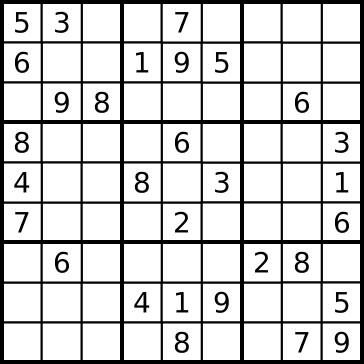 The aforementioned backtracking approach to Sudoku puzzles performs a lot more efficiently than primitive brute force. In fact, for the particular puzzle used throughout this article, backtracking requires about 37660 iterations, while naive brute force would probably have required about . iterations (51 blank spaces, 9 possible numbers each). Now that’s really, really a lot slower than the backtrack approach. Of course, while the backtrack approach might not be as fast as Donald Knuth’s Algorithm X, it should be fast enough for almost all puzzles out there. This is a great article! I have been working on different backtracking algorithms for Sudoku and I was having some trouble confirming the concept of basic backtracking. Showing the moving picture of the backtracking running was exactly what I have been searching all over the internet for. Thank you!